No ads, no clutter, and privacy protection: This is Ad Blocker for Me. Reduce stress and make browsing the web a relaxed experience on your Mac. Stop wasting bandwidth, increase the download speed and be sure that nosy trackers do not collect private informations about you: That is what Peace of Mind is made for! Blocking ads, media data and tracking mechanisms and other annoying content while you are browsing the web is equal to enhancing your experience. Peace of Mind comes with a rule set that consists of more than 45.000 rules on the strongest setting, this grants an outstanding and unrivalled performance. Relaxed and free of stress is also the setup. It is simple enough to squeeze it not this description, have a look below to know how it's done. There are just 3 switches that makes the setup a piece of cake. Of course you can tweak your settings if you think you really need to. Activate and de-activate media data. Media data are consuming a lot of bandwidth. Activate this to save bandwidth when you are on a slow network, or generally when you don't need media data at all. 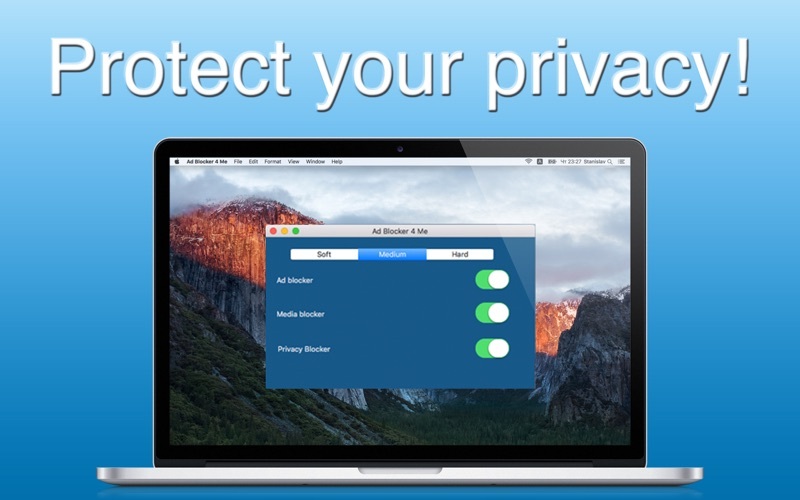 Activate and de-activate privacy protection. Activating this blocks several tracking mechanisms from websites. Besides of the 3 switches described above you have the option to define the strength of your ad blocker. You can choose between soft, medium and hard. In the strongest setting, which is called hard, the full set of rules is applied. Furthermore a configurable whitelist is available. The whitelist contains pages that are exclude from the rules, defined by you. To grant that your ad blocker is up to date you have the possibility to update your rules set. And of course, there is a feedback button to send us comments about Ad Blocker for Me - Add and Content Blocker.